Rosario is a radiant city on the move. It nestles neatly in a soft twist of the mighty Paraná River about 300 km northwest of the city of Buenos Aires. Construction is booming. New buildings sprout up on a seemingly daily basis. Large international manufacturers are locating their plants there and a swirl of hi-tech support centers are setting up shop. Due to its privileged location on the coast of the Paraná River, tourism and business have increased considerably in the last few years. Rosario freely displays its natural ‘water-world’ of the Upper Delta with its magic islands covered by lush vegetation. In the city proper there are a number of new international 5 and 4-star hotels as well as clean and friendly inns and hostels, museums of modern art, a curious blend of Spanish and Italian architecture, lovely parks harboring beautiful statues and monuments, beaches along the river front, restaurants with international cuisine and steakhouses where you can get the best and biggest Argentine beefsteaks you have ever seen, or taste the local gourmet specialty: fresh river fish. Rosario vies with Cordoba City as second largest in the country with over 1-million inhabitants. Its modern shopping malls are among the best in Latin America filled with quality products at bargain prices for the tourist. In Rosario you will feel the zest of a hard-working population that takes pride in its city. 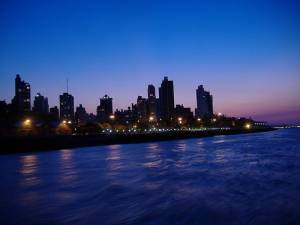 There are plenty of things to do in Rosario Learn to dance to Argentina’s most famous music: the tango; go to one of the popular theaters such as La Comedia and see great shows. Check out the Museum of Contemporary Art where internationally well-known painters such as Antonio Berni, among others are on display. Night life is exciting with lots of good discos, bars, sidewalk cafes and restaurants in a friendly, balmy, romantic atmosphere. You will also see why the women of Rosario are considered the most beautiful in Argentina. For relaxation, take a leisurely cruise on the Paraná River and thread your way through a maze of vegetation-rich islands in the delta or, if you are more adventure-minded, paddle a kayak across to one of the islands. In this case, remember that the river is wide, deep and has a very strong current. Ride bicycles or horses around the parks. Or just sit in the park and watch the dancing multicolored water-fountains. Backpackers will find many places to set up camp surrounded by nature on the islands where you can pretend to be in the middle of an episode of ‘Lost’. On the other hand, if you are really adventurous, soar through the air on a hang-glider, motorized or otherwise. And don’t forget to check out the house where “Che” Guevara, whose icon is displayed on T-shirts and tattoos of rebellious youth the world over, spent his childhood. The northern port area will soon be transformed into a modern development aptly named Puerto Norte along the lines of Puerto Madero in Buenos Aires. Rosario is the city where General Manuel Belgrano, one of Argentina’s most important forefathers, designed the country’s flag. Suitably, one of the most popular attractions in the city is the Flag Monument placed in the Parque Nacional de la Bandera (National Flag Park). General Belgrano´s remains are lodged in the monument’s crypt. This vast and fertile land of opportunity near the port was a strong magnet that galvanized several waves of emigrants into sweeping up river from Buenos Aires to Rosario in the late 1800s and early 1900s. These mostly Spanish and Italian immigrants came in search of new lives for themselves and their offspring. Today, thanks to them, Rosario is a vibrant city built on a strong agricultural, industrial and commercial base. Education of the new generations is important: it has six universities with around 80,000 students, 18 scientific investigation establishments and two technology transfer institutes. The city boasts a modernized port area where 78% of Argentina’s grain exports are shipped worldwide. For those equipped with portable computing devices, the whole port area and part of the river itself is covered by a modern WiFi system allowing cable-free access to the Internet at no cost. So, if you want to shoot off an instant picture taken in the area from your cell phone or laptop to a friend, just do it. The port is strategically located on the right bank of the Paraná River at km 420 that continues down to the Atlantic Ocean connecting the hinterland to the sea. Check out the right side bar for more information on Things to Do, Hotels and Hostels and Transportation and then come to Rosario and see where the action is!